by Vince Bushell Our sewer system is under ground, out of sight, and usually out of mind. Until something bad happens or something is different that we notice or when we find out how much this infrastructure costs. Some Riverwesters have been noticing a “smell” along the river and possibly in some homes. If you smell sewer gas or a plasticy smell in your home be sure to read the advice at the end of this column. Sewers create sewer gas, as part of normal operation, although you should not smell it in your home. It is not a pleasant smell. 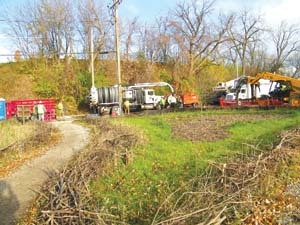 In November the Michels Construction was hired by the City of Milwaukee to repair a large sewer main that follows the Milwaukee River along Riverboat Road and continuing upstream beyond Locust Street. The municipalities own most of the sewer pipes. MMSD, the Metropolitan Milwaukee Sewerage District is in charge of the larger collection tunnels and overseas the sewerage treatment plants. Michels uses a method developed in the mid 1970’s called Cured In Place Piping or CIPP. This method was used along Humboldt Boulevard a few years back and Alderman Kovac said it was used recently along Newberry Boulevard. Kovac said some residents complained about an odor coming into their homes. This odor was not the regular sewer gas but a result of the CIPP process. A reinforced felt liner is pulled through the damaged sewer pipe after it has been cleaned. A resin, styrene, is sprayed on the felt and activated with heat (steam or hot water). The off gassing occurs during this activation process and it disperses quickly. I did smell it strongly on the day the styrene was activated and was able to notice it along the lower river trail near sewer manholes, a day later. As Kovac noted, the reason we are using this method is because of the cost benefit of the process. CIPP does not require digging up the streets, which would have many issues related to cost and pollution. CIPP is fast, less disruptive and much less expensive than digging up streets. This process is not only used for larger collector sewer lines. It is being used in Milwaukee on sewer laterals between homes and businesses and the city pipes on the west side of the city. You may see this in-place repair of sewer pipes to homes happening in additional areas of Milwaukee soon. The sewer laterals are a source of infiltration of rain and ground water in the sanitary and combined sewer system. This adds to the amount of water that is handled by the sewerage treatments process and is one of the causes of sewer over flows and basement back ups. This infiltration and inflow of water into the system makes efforts to control flooding and protect our waterways from pollution more difficult. Below is an article about sewer gas from the Wisconsin Division of Public Health. If you smell sewer gas, or during these repairs, styrene odor, this is an indication that you may have problems with your sewer lines, traps and/or vents in your home. How are people exposed to sewer gas? Flush floor and sink drains with water to prevent the traps in pipes to the sewer from drying out. (If you have an unused toilet in the basement add a bucket of water to fill the trap in the fixture).